Celebrate holidays that honor the past, cherish the present, and look forward towards a magical future with Elena of Avalor! All-new adventures are coming when the Elena of Avalor: Celebrations to Remember DVD releases on September 12th. 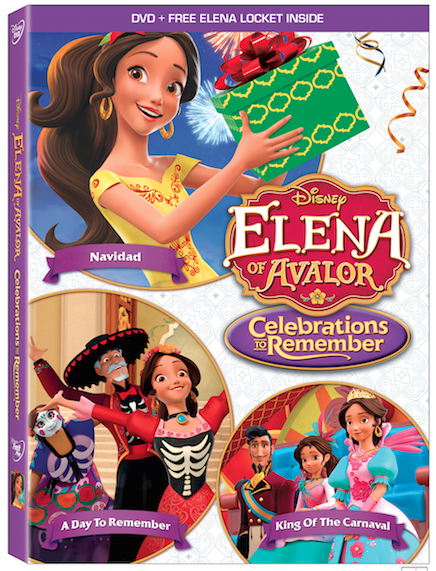 This new Elena DVD includes four celebration themed episodes, two bonus episodes, and a FREE exclusive Elena Locket! The new adventures on Elena of Avalor: Celebrations to Remember includes celebrating Navidad, Dia de los Muertos and Carnaval! If your family watches Elena over a bowl of cereal in the morning, you’re going to want to add this to your collection. For more Elena of Avalor fun, head over to DisneyJunior.com and play the Grand Gathering and Sticker Books Games. You can also print off a 5 Day Leadership Guide for kids that includes activities and challenges for kids preschool – 5th grade. Bring home your copy of Elena of Avalor: Celebrations to Remember on September 12th! Until then, I’ll leave you with this music video!